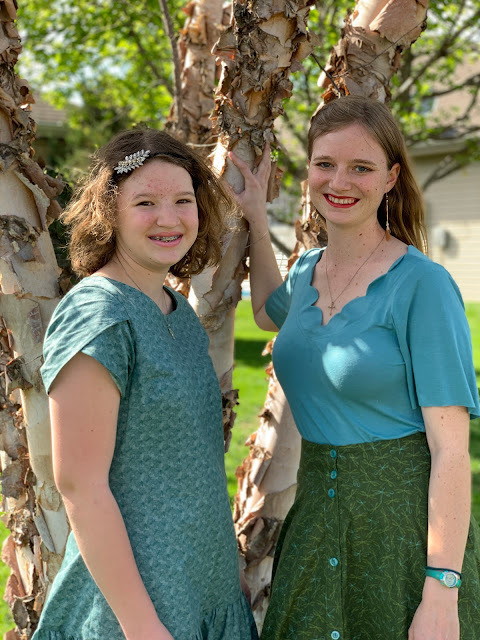 Our Easter outfits for this spring started over a year ago, when I brought home just over two yards of teal on teal butterfly fabric, with the full intention of turning it into a drop-waist dress for my sister. Of course, when I bought the fabric, I'd planned on making the dress right away - within a week or two, or at least within a month or two! As is often the case with fabric purchases however, I did not get around to the intended project as soon as I'd anticipated. A year later, the drop-waisted butterfly dress had not been made, and the fabric was still sitting on my shelves, in a bin with other fabrics, waiting. Who knows how long this fabric would have remained in that bin, hidden amongst the other fabrics in my stash, had it not been for this month's Winter Wear Designs blog tour "All Dressed Up". When the blog tour theme was announced, I suddenly remembered this fabric, and the plan I'd had for it. 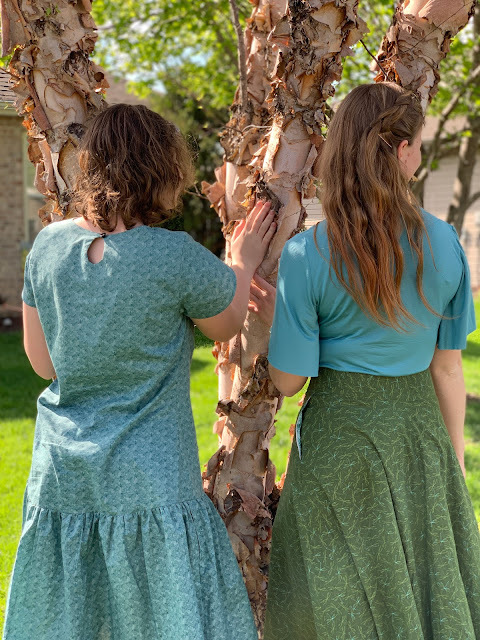 With the addition of a simple gathered skirt, the Classic Shell pattern by Winter Wear Designs would work beautifully to make my sister a sweet and pretty drop-waist dress. 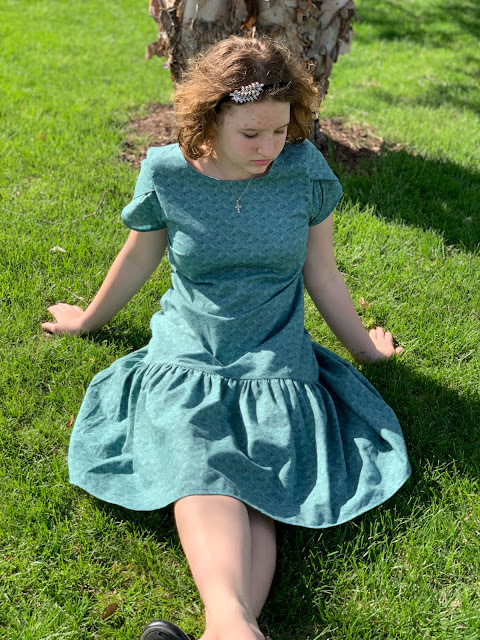 So, that's exactly what happened, Suzanne (the designer behind Winter Wear Designs) sent me the Classic Shell pattern, and I turned it into a dress. I cut out the pattern in my sister's size, making no changes, except to cut the back bodice piece with a center back seam, rather than on the fold, to conserve fabric. Then I cut two 14"(ish, I didn't actually measure, just eyeballed) strips of material the full width of the fabric. These two strips of fabric were gathered up and sewn to the bottom of the Classic Shell shirt to make a skirt. This was ridiculously easy to do, and produced a beautiful result. When called to the sewing room to try on the finished product, my sister was quite pleased with her new dress. It fit her wonderfully, and was perfectly lovely, fluttery, and springy. Just the thing to wear on Easter Sunday! Personally, my favorite part of the dress is the sleeves. I love tulip sleeves, so when I saw the Classic Shell offered them as an option, there was no doubt in my mind what type of sleeves this dress would have. Now I couldn't let my sister have all the fluttery dress fun, could I? Originally, I had no intention of making myself something for this blog tour, nor did I have specific plans to make myself an Easter Outfit. Then Winter Wear Designs released a new skirt pattern, the Boulevard Skirt, and I just had to make it for myself. 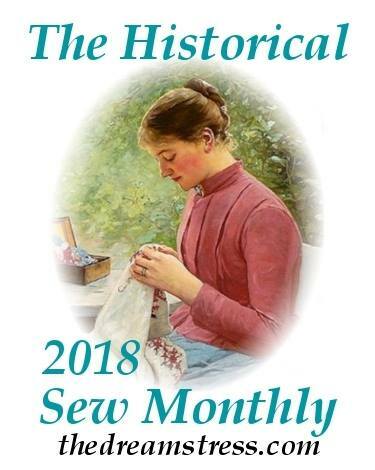 So, I asked Suzanne if I could have that pattern too for this blog tour, and she agreed, very quickly, and sent it to me. The Boulevard skirt is a button-front skirt, with multiple different length options, plus two high-low length options. 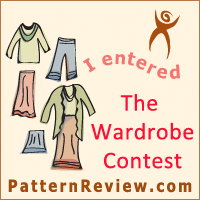 It was the maxi length high-low option that caught my eye when the pattern was released. It was fabulously swooshy. Thus, it took no time at all for me to decide which version of the Boulevard skirt to make myself. All I had to do was decide what fabric to make it out of. I loved the butterflies on my sister's dress fabric, and wanted my skirt to also have a butterfly theme. The only problem was I had no other butterfly fabrics in my stash. Intending to only use fabrics from my stash to make my outfit, I considered making the skirt from a solid colored fabric and appliqueing butterflies on. I'd gotten as far as finding a couple different suitable plain fabric options for this plan, when I wound up at Hobby Lobby with my brother's girlfriend. At Hobby Lobby I found the prettiest green quilting cotton, covered in little green dragonflies. The dragonflies were accented with teal, so they would match the butterflies on my sister's dress fabric wonderfully. I admired the fabric for a couple moments, wondering if I should actually buy it, when my brother's girlfriend wandered over, took one look at the fabric, and said "That fabric screams Alyssa, you have to get it." She convinced me (not that I really took that much convincing), so I bought it, along with a yard of teal rayon/spandex to make a matching Outer Banks Boat Neck (arguably my favorite WWD pattern, seeing as I've made it 10 times now!) to go with the skirt. I used my scalloped neckline hack for the shirt and chose to make the sleeves short and fluttery by cutting out the short bishop sleeves, included in the pattern, and just leaving off the bottom band/cuff. I chose not to hem the sleeves as I didn't want to mess up the drape of the sleeves with the weight of a hem. Knit fabric doesn't really fray, so this works just fine. To tie the whole look together I finished off my skirt with teal vintage buttons, found at a local antique mall last fall. I had two different sizes of these buttons and there card of smaller buttons contained the perfect number for my skirt. I'll save the larger buttons for a future project - buttons of this pretty color are sure to be needed again! Teal and green are some of my favorite colors, butterflies and dragonflies just make me happy, so combine the two, and I really love how my sister's and my Easter Outfits turned out this year! They're different in style, but similar in theme and wonderfully fluttery! Just the thing for getting all dressed up on Easter Sunday and throughout the rest of the spring! 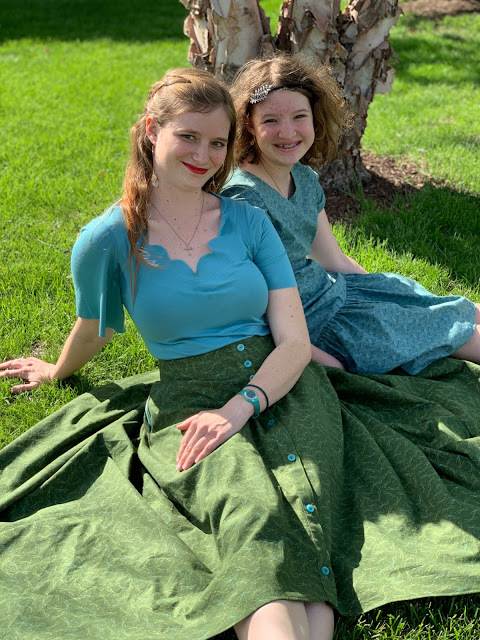 A Huge thank-you to my cousin Kate for taking pictures of my sister and I Easter Afternoon! *I received the patterns used in this post for free in exchange for this blog post, but all thoughts and opinions expressed are my own. All day Saturday, I worked on Easter Outfits. And on Easter morning, my mom, sister, and I each had a brand new outfit to wear to church. 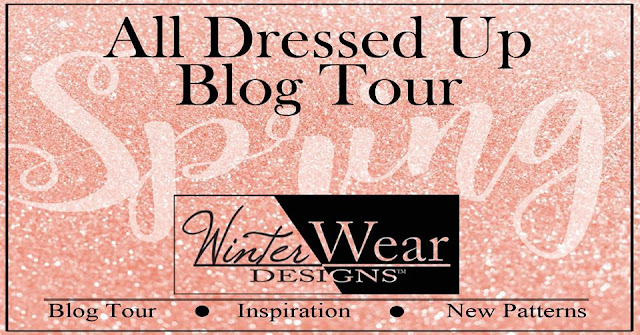 I'll share about the clothing worn by my sister and I later this week as part of the latest Winter Wear Designs blog tour. Today, however, I'm going to share all about my mom's outfit. This outfit began when I found a rose printed stretch denim at a small Mennonite fabric store. The fabric immediately caught my eye and I stood there, handling and admiring it, and wondering if I ought to buy it. I had no idea what I would make with rose-printed stretch denim, but it was pretty. Then my mom walked by and solved the dilemma for me. "I'd wear a pair of jeans from it" my mom said. Thus, I bought the rose covered stretch denim, sometime in March, with every intention of turning it into a pair of jeans for my mom. 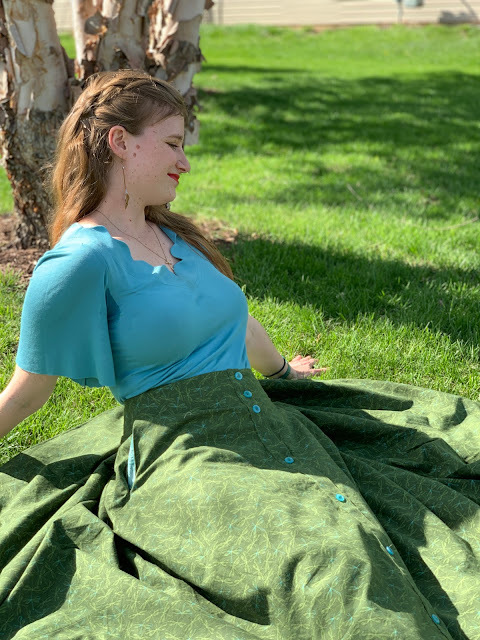 Sometimes you don't *need* to turn the pretty fabric into something for yourself, you just need a chance to work with it, handle it, turn it into something pretty and wearable for someone. Such was the case with this denim. A couple weeks ago, I finally cut into the denim, using the Simple Skinny Jeans pattern from Sew Liberated. (The same pattern I used to make these jeans for my mom). With a knit waistband and no fly, this is a super quick and easy "jeans" pattern to make. It goes together in under 4 hours and, judging by how often my mom wears the pair I made her for Christmas, appears to be very comfortable. Anyway, back to the making of the jeans. The cut out jeans have been sitting in a basket next to my sewing machine, just waiting to be assembled, for a while now. Saturday afternoon, upon finishing the Easter outfits for my sister and I, I decided I really wanted to make something new for my mom too. So, out came the jeans. The floral pattern seemed quite Easter appropriate. The first thing I do every time I make jeans, is decorate the back pockets with a bit of top stitching. Coming up with a decorative top stitching idea and executing it, is my favorite part of the whole jeans- making process. For this pair of rosy pants, I decided to use gray top stitching thread, as that's what I had on hand that coordinated nicely with the fabric. The top stitching just about disappears in the rose pattern of the denim - but I know it's there and it makes me happy. More visible top stitching might be a bit of a sensory overload with this already busy fabric. The fly on this jeans pattern is completely faux - just some top stitching on the left (when you're wearing the jeans) front panel. So, just top stitch and go, that's what I've done the past two times I've made this pattern. This time however, I decided to add something extra. No, I didn't make it a functional fly in any way, shape, or form.What I did is add a fly facing of sorts to make the fake fly a little more substantial and prevent the top stitching from stretching out the fabric of anything. It may not look like much, but it does give the fake fly a more "real" appearance. I finished the jeans early saturday evening, and presented them to my mom. She was surprised and appeared to be quite pleased with them, though she did comment that she wasn't sure what shirt she had to go with them. She needn't have worried, I'd already thought of that. I cut the Miramar for my mom tunic length, as she prefers longer tops with her skinny jeans. As this top only requires two pattern pieces, it was cut out and ready to sew very quickly. This pattern really is a quick sew, generally, and in the beginning this particular top went together very smoothly. I sewed the shoulder/upper sleeve/collar seam and side seams with my serger easily enough. Then it came time to sew up the center front seam with my sewing machine and all the troubles started. My machine hated this fabric. As best as I can tell (the bolt wasn't labeled), this fabric is a rayon rib knit with a very high spandex content and incredible stretch and recovery. I set my sewing machine to my standard settings for sewing knit fabric, popped in a ball point needle, and began sewing the center front seam. The thread broke. And my machine kept skipping stitches. So, I figured there was something wrong with my thread and my needle must be dull. I pulled out another spool of thread and a brand new ballpoint needle. Stitches were still getting skipped. The thread broke again. These are the issues I had when I first started sewing with knits several years ago. Yet, ever since I learned to use a ballpoint needle and a shallow zig-zag stitch, I've been fine - sewing knits with no problems! However, I believe due to the insanely high stretch capacity and spandex content of this fabric, my normal knit settings were not working with this fabric. Finally, I discovered the lightning bolt stitch (which is technically the knit stitch) worked decently well (better than the zig-zag at least), and I managed to sew up that center front seam. As my mom prefers her necklines to be not low cut, I raised the neckline about an inch higher than the necklines on my Miramar tops are. Once that center front seam was done, I decided the less hemming the better with this shirt. So I finished off the sleeves with knit bands/cuffs. Then came the actual hem. I was only going to do that once with this devilish fabric, so I had my mom try on the shirt to make sure the length was just right before sewing anything. She tried on the shirt, we decided to shorten it 2", and then I began the hemming. Through trial and error I discovered the closest thing to a decent hem I could get required me to first serge the bottom edge of the fabric, then turn that up and hem by stitching through the serging with a rather wide zig-zag stitch. This is still far from a "pretty" hem, but at least it's hemmed! Looking back, what I really needed was a different needle. Either a "stretch" or a "microtex" needle may have worked better with this fabric and its insane spandex content than the ballpoint did. However, I had neither of those needles on hand, and I had too much to get done Saturday night to run into town to buy one. Thus, please, don't look too closely (or at all) at this hem. 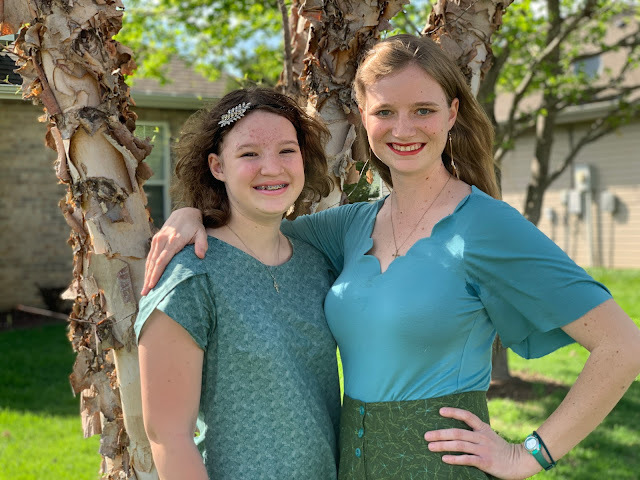 The hem got sewn, the shirt was finished, and my mom, my wonderful mother, wore her new outfit to Church yesterday morning to celebrate the Resurrection of Jesus. And it's a darned good thing that Easter is about Jesus, his perfect life, death, and resurrection, not perfect hems. My high school biology and chemistry teacher contacted me in March, asking if I could take on a commision for her. The school she now teaches at was having a "Hairy Pawter" themed open house, and she needed a Minerva McGonagall costume for the event. Now this was right up my alley (especially considering I made myself a Minerva McGonagall inspired 1890's outfit last summer), so I was thrilled to accept the commision from one of my favorite former teachers! The simple elastic waist black skirt was easily assembled in a couple hours one morning, then it was on to the fun part of the commision - the hat! I decided to use Simplicity 4677 (a reprint of a 1970's pattern), view 1, for the hat itself, as it appeared to be just the right shape and size. For the brim, I adapted the brim pieces from Simplicity 1293, view E. I drafted the earflap pattern myself. As for materials, the main fabric is a plaid cotton flannel, the brim is stiffened with interfacing, and the crown is stiffened with a sew-in foam interfacing and lined with the black poly/cotton broadcloth leftover from making the skirt (mentioned at the beginning of this post). All the fabrics and interfacings came from Joann's. I cut out the foam interfacing for the crown without any seam allowance, then centered it on the crown lining. I attached the foam to the lining, by zig-zag stitching all along the outer edge of the foam. After that, I decided the lining and interfacing could be anchored together a bit better, so I decided to do some basic quilting. I marked lines from the point of the crown to the bottom edge, and sewed along them. Once that was done, I was satisfied the hat would be able to hold it's shape, and the lining would not be droopy in any way. So I sewed up the center back seam of the lining. Per the instructions of Simplicity 4677, I left the middle 3" of this center back seam open so I'd be able to turn the hat right side out later. With the lining all ready to go, it was on to the visible, pretty, part of the hat. 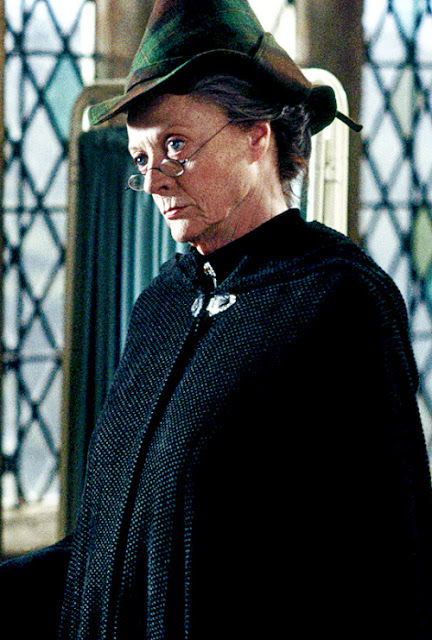 It was obvious from the 45 degree angle of the plaid in all the pictures I referenced, that Professor McGonagall's plaid hat was cut on the bias. So, that's how I cut my reproduction. I re-shaped the front brim from Simplicity 1293 ever so slightly to curve smoothly in the center front, rather than ending in a point. As the underside of the brim and earflap pieces were likely to be seen, each piece was "lined" with the same fabric. Once all the pieces were cut out, I interfaced them. The front and back brims were fused with a stiff apparel interfacing - the type of stuff used to interface shirt collars. This would lend the perfect amount of structure to the brim. The earflaps didn't need any stiffness added to them, just a bit of structure. So, I used non fusible interfacing on them, and instead opted to interline them with another piece of flannel - this one cut on the straight of grain, rather than the bias, to prevent the ear flaps from stretching out of shape. For the ties at the end of the earflaps I decided to use a black and metallic ribbon-type trim acquired on clearance from Hobby Lobby. It coordinated nicely with the plaid, and I already had it in my stash! Once all the pieces were properly interfaced or flatlined, I sewed the top fabrics and linings of each piece right sides together, leaving the top edge, where they would attach to the crown of the hat, open. I sewed up the back seam of the crown, turned everything right side out (and pressed it flat), then pinned the brim and earflap pieces to the bottom edge of the crown. Once it was all pinned in place, the plaid hat was placed inside the crown lining. The brim and ear flaps were sandwiched between the crown and crown lining pieces and everything was pinned together. Finally, I sewed everything together all around the bottom edge of the crown. Then I turned the hat right side out, by pulling everything through the opening left in the center back seam of the crown lining. Once everything was pulled through, I used the ladder stitch to close up the opening, and the hat was done! The ear flaps can be tied down under the chin. . .
Or up behind the head! I think either way, the trim I used for the ties blends in very nicely. The original hat in the Harry Potter movies, had matching fabric ties. I decided against making those because I didn't want to turn itty-bitty tubes of fabric right side out. That can be time consuming and finicky! Thus, I'm very pleased with how the not-entirely-matching tied turned out. The hat took under two hours to make - which is pretty quick considering I'd never made a hat quite like this before so I was figuring out the pattern and order of construction as I went along! 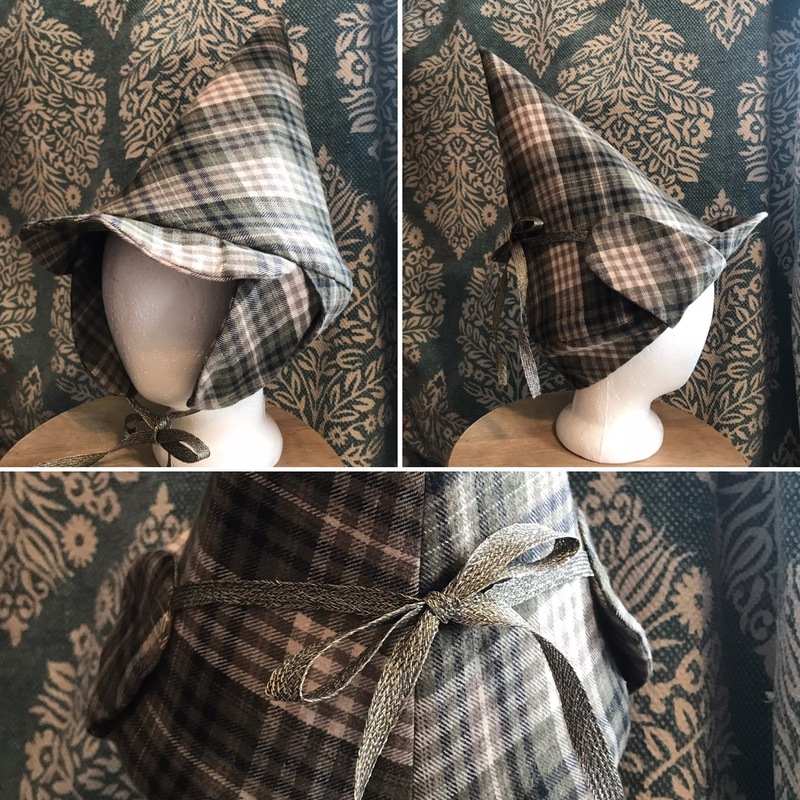 My former teacher was thrilled with her hat when I delivered it, and I hear she was instantly recognizable as Minerva McGonagall at the "Hairy Pawter" open house the following Saturday - which is just what we wanted!